-Instruction: Ball is placed on the ground in front of the player. The player should try and position himself just a little bit outside the path of the ball. As the ball gets within reach the player should complete the footwork as listed. The left foot should be a little bit behind the right foot in order to create an angle and path toward the target. This angle, therefore, allows the player to receive a bad hop off of their body in the direction of the base providing an easier way to recover. It also clears a path to allow the right leg to drive across and create momentum with his legs. The reason the player wants to be slightly outside of the ball is to be able to see the speed and “hops” of the ball better. A ball moving straight at the player is sometimes more difficult to judge those characteristics that are extremely important to each individual ground ball. These characteristics include the speed, direction and height. Also with the player slightly outside the ball it makes it easier for him direct his momentum toward the target and allows the player to use more power generated from his legs rather than solely his arm. This in return will put less stress on a player’s arm. 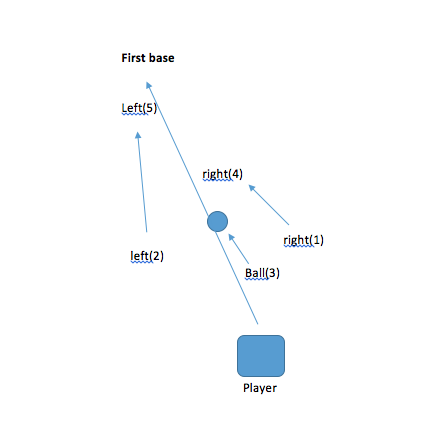 The player should also work on working from the ground up. Working from low to high makes it much easier to recover from a ball that suddenly skips lower than expected. It’s also easier to adjust up and keep your momentum going toward the base. If the player isn’t low enough it will disrupt his rhythm to adjust down slowing him down significantly. -Instruction: player and/or coach should place a hat in front of the stationary ball. Player should work around the ball in a “C” motion. This will create a habit of working just outside the ball. This is especially helpful for kids who are younger because it helps to have something providing an obstacle to work around. It’s a little more visual rather than theoretical.